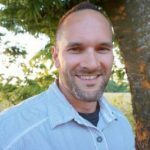 For those of us who suffer from low back pain throughout the day, bedtime doesn’t necessarily equal pain relief. In fact for many, it’s often the most frustrating part of the day as the pain prevents you from getting a good night’s sleep. There is so much information on the internet on how to sleep with lower back pain but it’s pretty obvious some of the authors have no clue what it’s like to actually deal with this nightly issue. As most of us know, not getting enough sleep due to back pain or waking up with back pain sure is a great way to start the day off on the WRONG foot. There exists a vicious cycle between lower back pain and sleep issues. It’s hard to get good sleep when your back hurts and sometimes your back hurts because you’re not getting enough good sleep. Whether you have a bulging or herniated disc, sciatica, spinal stenosis, strain, are pregnant, or suffer from any other type of lower back pain, here are some proven tips to minimize your lower back pain at night so you can finally get a good night’s sleep. For some, a simple adjustment to their sleeping position is all that it takes while others may need to also consider investing in a new mattress or pillow depending on their current setup. What causes nocturnal lower back pain? Just like any other type of pain in the lower back, the actual cause is often unknown and is one of the hardest types of pain to diagnose. Often, the discs in your spine are the culprit whether from an injury, genes, sitting too long during the day, or a variety of other factors. Muscles also play an important role which cause issues with spine alignment and spasming trigger points. It’s even possible for the source of pain to be located in an entirely different area and it radiates to the lower back region. While it’s hard to pinpoint the cause, the goal here is to determine the best way to sleep for lower back pain sufferers. 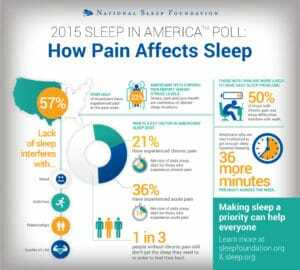 How do sleep and pain relate? Those with chronic pain lose an average of 42 minutes of sleep each night due to pain. 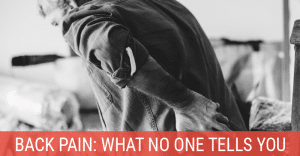 Those with acute pain lose an average of 14 minutes of sleep each night due to pain. 50% of chronic pain sufferers say that sleep difficulties interfere with their job. 23% of those with chronic pain also report higher stress levels. In another study conducted by the Asian Spine Journal, 3,100 individuals with chronic low back pain were surveyed to help understand how their pain affected their quality of life. Of these individuals, over 32% reported that their lower back pain was severe enough to cause sleep disturbances. What we can take away from these studies is that when pain becomes an ongoing issue, sleep problems will also become more common. This in turn can completely affect a person’s quality of life. In the case of lower back pain, an individual may experience microarousals from the pain throughout the night forcing them to go from a deep sleep to a lighter sleep stage which can then lead to awakenings. Tip: An easy way to see your ratio of deep, REM, and light sleep as well as how much time you spend tossing and turning at night is by wearing a Fitbit around your wrist. Like most things, there is no “one-size-fits-all” approach to the best sleep position. While side sleepers make up the majority of the population (some say up to 70% of all people), it’s surprisingly not the best position to sleep for lower back pain. Here are the three sleeping positions ranked by order of best to worst. Place a large pillow under your knees to help your spine maintain a natural curve. Use a good pillow for back sleepers under your head. For extra support, place a rolled up towel under the small of your back. Sleeping this way allows gravity to help naturally re-align your body. If you have a fairly soft mattress, sleeping on your side is a better option. A fairly good sleep position for bad backs as long as you make a couple adjustments. Bend your knees so they’re slightly to your chest and place a pillow between them. Without a pillow between your knees, your top leg will most likely drop down and forward and cause your spine to rotate unnaturally. Using a body pillow offers the best support for side sleepers and keeps your entire body correctly aligned. Otherwise, a not-too-plush pillow for side sleepers should be used. 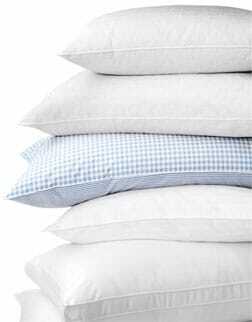 If not using a body pillow, it also helps to put a large pillow under your upper arm to better support your shoulder. Placing a small pillow (try different sizes) under your waist has also been proven to alleviate back and hip pain for side sleepers. If you sleep on your side and get shoulder pain, your mattress is probably too hard. A softer mattress or simply adding a comfortable mattress topper are both good solutions. For a small percentage of people, this is the only way they can sleep. If you have to sleep this way, place a thin pillow (here are some good recommendations) under your pelvis and lower abdomen. Don’t use a pillow under your head if causes too much strain on your neck. Sleeping on your stomach is the absolute worst position to sleep in if you have lower back pain (or neck and shoulder pain for that matter). 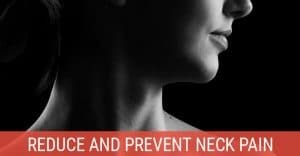 Not only are you flattening the natural curve of your spine, you are forced to rotate your neck for hours at a time which can cause all sorts of issues in your neck, upper back, and shoulders. Sleeping on your stomach provides no support for your spine and adds unnecessary pressure on joints and muscles. You already hurt bad enough, don’t make it worse. Most people can successfully switch over to a side sleeping position if they work on it, although it’s a bit more difficult to make the move to becoming a back sleeper. If you absolutely must sleep on your stomach, put a pillow under your pelvis and get rid of the pillow under your head. Getting in and out of bed is probably something you never gave a second thought of but there are actually correct ways to get into and out of your bed safely. The steps below are very similar to what people who have recently undergone various surgeries are instructed to do. Sit on the side of the bed. Using your hands for support, bend your knees and carefully swing them onto the bed. With the help of your arms, roll onto your back. Bend your knees so your legs are hanging off the side of your bed. 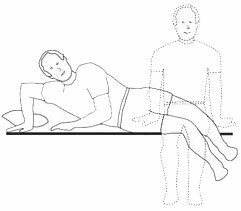 Push yourself up with your arms and swing your legs over the side of the bed to get to a sitting position on the side of the bed. Gently push off with your arms to a standing position (try not to bend forward at the waist which puts extra stress on your lower back). Mattresses are something that I would never, ever encourage anyone to skimp on. To put it as clearly as possible, if your mattress is causing you to not sleep comfortably or is producing back pain (or other kinds of pain), get a new mattress. Period. According to the Better Sleep Council, your mattress can be a major source of low back pain and should be evaluated every 5-7 years. Most experts also tend to agree that a mattress which is used on a daily basis should be replaced every 8-10 years in most cases. There are of course other factors that affect the life of a mattress such as the construction quality and weight of its users. That said, ANY mattress that is no longer comfortable to sleep in should be replaced no matter how old it is. 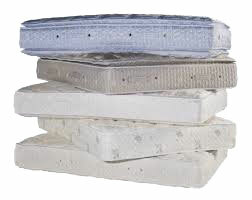 We get it… mattresses aren’t cheap but neither are medical and pain management expenses as a result of a bad mattress. The truth is that a new mattress can be one of the best products for back pain that you can buy. For the longest time, the consensus was that a firm mattress was beneficial for low back pain even though there is almost no evidence of this belief. In recent years, this belief has been challenged. Surprisingly, not a lot of studies exist on mattresses and lower back pain. 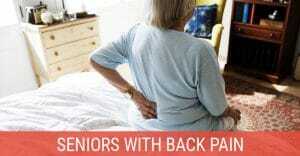 But one study has concluded that a medium-firm mattress provides the best pain relief for those with lower back pain. The ultimate goal is back support and comfort. The best type of mattress for a lower back pain side-sleeper is probably different for a back sleeper. If you sleep on your side, the mattress needs to be soft enough for your hips and shoulders to sink in to avoid those painful pressure points. Be sure to check out our article on how to minimize hip pain during sleep. With back sleepers, weight is distributed more evenly so a firmer mattress may be more ideal. Mattresses that are too soft tend to be the worst for lower back pain sufferers as they don’t offer the necessary support for proper spine alignment. Our recommendation is to take advantage of the generous offers mattress manufacturers or stores have in regards to returns after 30, 60, or even 90 nights of sleep. Do your research about the various mattress types (Sleep Like the Dead is a great site to start with) and don’t be afraid to buy a new mattress. Worst case is you don’t like it, return it, and try another model. Personal Note: For anyone wondering, after WEEKS of research, I went with the Nest Bedding Alexander Signature Series mattress (in medium). It’s simply the best memory foam mattress you can get which doesn’t sleep hot like other memory foam brands. My lower back never felt better in the morning and the shoulder pain I had from my previous mattress is gone. Use coupon code “OMG100” to get $100 off the Alexander Signature Series at Nest Bedding. Pillows are often overlooked when it comes to helping low-back pain sufferers get relief. While the type of pillow you use under your head may not make a dramatic difference, adding pillows (ie: between your knees, under your knees, under your hip) is often extremely helpful. See the “best sleeping positions” section above for tips on this. That said, there are some general guidelines for the pillow that your head rests on depending on your sleep position. Optimally, your head will be in the same correlation to your spine and shoulders as if you were standing in a correct upright posture. This is called neutral alignment. Is sleeping on the floor good for your back? Some people, even those without back pain, say that there are benefits to sleeping on the floor. If you currently have a soft mattress and have a difficult time sleeping due to lower back pain, it’s probably worth a shot and may very well end up as a free alternative to a new firmer mattress. Back sleepers are generally the best candidates to sleep on the floor as that’s really the only recommended position as it offers your body the best natural alignment. We’d recommend something like a yoga mat or sleeping bag between you and the floor to provide enough cushioning. It’s not recommended for side and stomach sleepers to sleep on the floor as your weight isn’t distributed very evenly which can cause too much pressure on joints and trigger points. There’s one thing I’ve made part of my nightly routine that has made falling asleep so much easier. When I get in bed, I lay on top of my Spoonk acupressure mat for about 30 minutes every single night while I read. Not only does this almost immediately take away the majority of my lower back pain from the day, it helps me relax and fall asleep quicker. My wife would tell you she’s stopped counting the number of times I dropped my Kindle on myself because of how quickly I fell asleep. Here’s a comparison of the two best acupressure mats on the market today. I’m having a microdisectomy on my L5/S1 in a couple weeks. I hear sleeping is going to be rough for at least a few nights after. Any tips? As someone who’s has the surgery (L4/L5), I’d have to agree that sleep was difficult for at least the first couple days although others I know said it wasn’t too bad. You may or may not get a couple hours of sleep at a time. I definitely found sleep on the side to be the most comfortable. If possible, put pillows in front of and behind you to keep you from moving too much. Stay on top of the meds as well and you should get through it fine. I was always told that firm mattresses are best for back pain. I have gone through 3 different firm or extra firm mattresses and was in pain on all of them. Have I been doing it wrong this whole time? I’ve been told the same thing since my high school days. It really depends what sleep position is most comfortable for you. Laying on my back on a hard surface or firm mattress feels good on my back but I could never fall asleep that way. I’m a side sleeper and found a soft/medium mattress is the absolute best for me. I honestly believe I could have avoided a shoulder surgery if I didn’t sleep on a firm mattress for about 5 years.